It was a longer period of icky weather in the south of Germany when on Thursday, February 18th, the sky cleared up for a few hours and an almost full moon appeared. Nevertheless, it was very cold outside. Inside the Manufaktur, one of Mats Gustafsson’s favorite jazz clubs worldwide, it was quite cosy, though. The club, which also promotes rock shows, dance events and night flea markets, is a marvelous venue when they present jazz concerts. The people sit at small tables, an exquisite jazz record dealer is a permanent fixture and huge banners at the walls show Roy Campbell, Peter Brötzmann, Matana Roberts and Joe McPhee. McPhee has been a welcome guest before in Schorndorf, for example with Peter Brötzmann’s Chicago Tentet + 1, Universal Indians, and Survival Unit III. 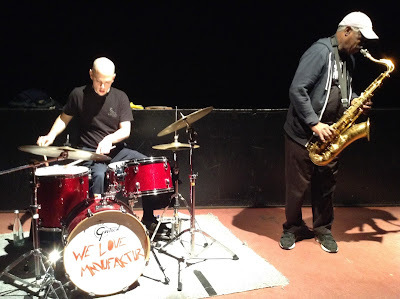 This night he brought along drummer Chris Corsano, who debuted at the club. Both have released three albums so far, Under A Double Moon, Scraps and Shadows and Dream Defenders, all three of them full of excellent boisterous and soulful music. Corsano, a man who looks like one of the young boys in a William S. Burroughs novel, is known for his punk/rock/jazz background (he has played with musicians as different as Björk, Thurston Moore, Nels Cline and Paul Flaherty) and his intensive and imaginative style. That’s why some people might have expected a rough set - and they were not disappointed at the beginning. However, the two musicians’ mission was a different one that night - they were there to play the blues. And who could play this music better than Joe McPhee, the great man of sorrows on the scene. After the second track he said that he had always liked to play ballads, just to start a solo number which was so tender, touching and fragile that the audience hardly dared to applaud. Then he announced a tribute to Ornette Coleman, one of his “personal gods“. McPhee knew Coleman from the early 1960s because his apartment in New York’s Barrow Street was close to Coleman’s rehearsal room, and the version of “Lonely Woman“ he played then was of the utmost beauty, the atmosphere he created made the imaginary woman’s loneliness, desperation and desolation almost tangible. In addition, Chris Corsano was the expected congenial partner. In the second set he used a lot of extended materials like bows, woodblocks and hoses to create spherical off-the-wall sounds. On the other hand his drumming reminded a lot of Milford Graves and Sunny Murray that night which fit very nicely to McPhee’s heavy vibrato sound. It’s often been surprising how deep, sensitive and subtle his drumming can be. “When you hear music, after it’s over, it’s gone, in the air. You can never capture it again“. McPhee howled this phrase again and again before he left the stage (in a very good mood, by the way). There’s nothing more to say. After a 70-minute-drive I arrived home. It had started raining again. Yes, McPhee was quoting Dolphy, he said that in the concert. And yes, Dan, it's Paul Flaherty, not Michael. Sorry for the mistake and thanks for pointing it out. Paul will fix it. Yes, a truly compelling concert (I was there on the 8th in Paris' Instants Chavirés), with amazing sound and the stimulating link to history. Thanks Martin for helping to fix these memories! Thank you, Olivier, very nice words.